In a medium bowl, add warm water, yeast, and sugar. Give it a quick stir and let sit (proof) for 10 minutes. Add the 1 tbsp. 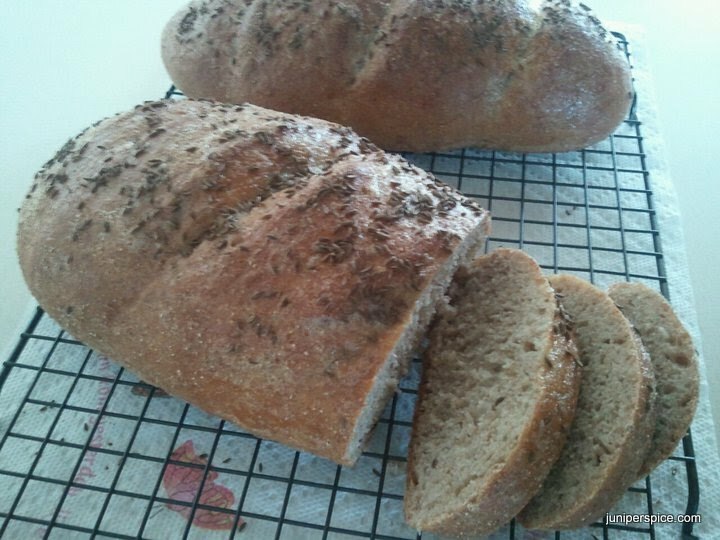 caraway seeds, salt, rye and bread flours. Stir until just combined and the dough holds together. Lightly flour a clean surface and turn dough out. Adding extra bread flour as necessary, knead dough until smooth and elastic, about 8 - 10 minutes. Grease a large bowl. Add the kneaded dough to the greased bowl and turn to coat with oil. Cover with a clean dish towel and let rise in a warm place for an hour, or until doubled in size. I find putting the bowl in an oven with the light on (but NOT the oven) is a nice warm spot. Grease a large baking sheet or cover in parchment paper. Once doubled, divide dough in two halves. Form each half into a rustic loaf, about 3 inches in width and height and 10 inches long. Put the loaves on the baking sheet and cover with dish towel. Return to the warm place for another 30 minutes or so. The loaves should double in size again. Once risen, pre-heat the oven to 400º [if your loaves are rising in the oven, make sure to remove them before preheating]. Cut 3 diagonal slashes in the top of the bread, evenly spaced. Brush egg and water mixture over the top of the loaves. If using, sprinkle 1 tsp. of caraway seeds over each loaf. Bake for 30-35 minutes, rotating pans after 15 minutes, until browned. Cool on wire racks.